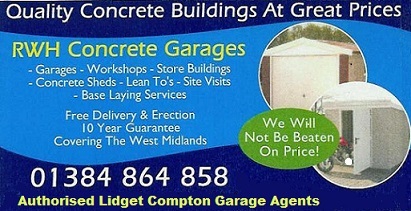 a Lidget Compton building provides you the customer with a quality,fit for purpose building at a truly remarkable price. 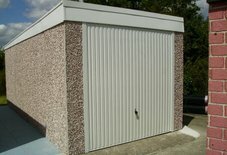 These Pent concrete garages come with a rearward sloping roof clad with galvanised steel roof sheets and a Graffotherm anti-condensation treatment on the underside,which are secured to heavy duty galvanised steel, box section roof trusses,(A forward sloping roof is also available with internal downpipe). 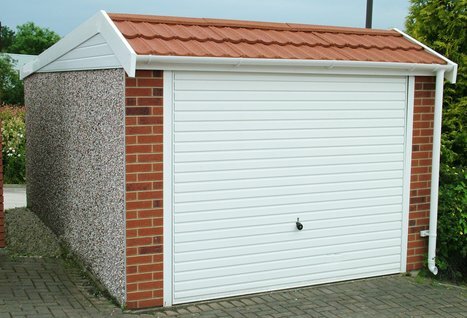 These pent garages includes a Hormann fully retractable up & over door, in a white powder coating or a colour of your choice,a 4ft timber framed window as standard.There are various optional extras available such as; maintenance-free fascias, personnel door (wooden or steel), brick front posts, PVCu /opening windows, guttering and sand/cement internal fillet. 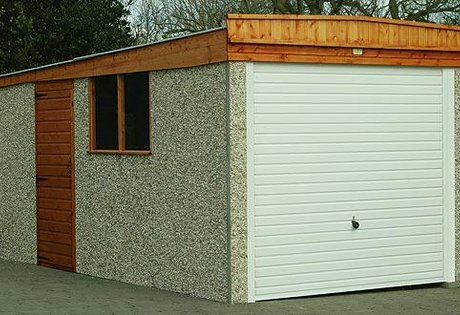 This model is also available as a Pent High, giving extra height to the eaves and extra door clearance, very useful for 4x4's and people carriers and is available in five single widths (8'6", 9'6", 10'6", 12'6" & 14'6") and five double widths (16'6", 18'6", 20'6", 22'6" & 24'6"),there are nine standard lengths available in 2ft increments from 14'3" up to 30'3" long.